Investment in wind power is largely driven by China, where removal of regulatory restrictions in the country's northern provinces sparked a 2 GW, or 37%, rise in 2018 to a total installed capacity of 5.6 GW. Worldwide, nearly 52.2 GW of net wind power capacity was added last year – a 4% annual rise, according to Wood Mackenzie’s Global Wind Power Market Outlook Update: Q1-2019. 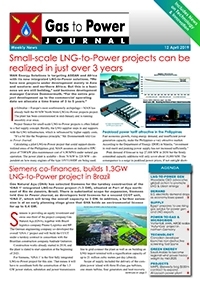 April 24 – The global Smart Grid Market is expected to reach around $70 billion, growing at an annual rate of 15.56% in the coming years through to 2027.North America is forecast to see the largest revenue growth, according to ResearchNester, while Europe also shows promising growth in smart grids due to high awareness for decentralized power generation, battery storage and conserving energy. April 23 – The Chinese National Energy Administration (NEA) has allowed 11 provinces to resume building coal power plants in a move that lies bare the country’s dependency on thermal coal even after several hundred billion dollars were invested cleaner energy sources, notable wind, solar and natural gas. Areas earmarked by NEA for new coal power plants include Qinghai, Chongqing, Guangxi, Guangdong, Yunnan, Guizhou and Henan. April 17 – Birdsboro Power, a subsidiary of EmberClear of Canada, is in the process of commissioning the $500 million Birdsboro open-cycle gas power plant. Built on a site of the former Amourcast steel foundry, and driven by a GE 7H02 turbine, the new power unit will generate about $500,000 in revenue for the Reading Area Water Authority and another $125,000 city of Reading, Pennsylvania. All electricity will be supplied into PJM Interconnection, the power grid operator in the U.S. Northeast. April 17 – Rising cost of carbon emissions and closures of coal power stations throughout Europe have led to gas-fired generation overtaking the output of other fossil fuels for the first time. According to EnAppSys figures, gas power plants in the EU produced 117 TWh of electricity in the first quarter of 2019, compared with a combined 110.9 TWh from coal, lignite and gas-to-coal plants. April 16 – ABB and Porsche have agreed to develop electric vehicle chargers for Porsche Japan’s new electric vehicles, including Tayan – the carmakers’ first fully electric car due to be launched in 2020. Under the deal, Porsche will install ABB chargers at its public facilities across Japan, creating a network of fast-charging stations for its electric vehicles. The first installation is set to go live in mid-2020. April 15 – Increases of U.S. electricity generation from biomass have stopped after a decade of growth. Power produced from biomass totaled 70.6 million megawatthours (MWh) in 2018, or about 2% of total U.S. electricity generation, according to EIA figures. Having grown from 2004 through 2014, and the 2018 output was 2% below its peak generation of 71.7 million MWh. April 12 – The global market for aeroderivative gas turbines is seen grow at a 7% rate to surpass $3.5 billion by 2024. A main growth driver, according to Global Markets Insight, will be the rising adoption of small-scale turbine-driven cogeneration plant and the trend towards decentralized energy supply. April 11 – Utility-in-a-box software, developed by Lumenaza, creates a regional green power grid by connecting producers and consumers of locally produced wind and solar energy. The system monitors renewable power output, balances supply and demand, and can help organize the billing process. Pilot projects have been implemented with two of Germany’s big utilities, E.ON and EnBW as well as with various smaller players. April 10 – Mitsubishi Hitachi Power Systems (MHPS) has agreed to license production technology for its H-25 series gas turbines to the Chinese manufacturer CSIC Longjiang GH Gas Turbine Co. The agreement will establish a small local supply chain which helps expands MHPS’ share in the Chinese market, the Japan-based company stated. So far, MHPS received five orders for H-25 Series gas turbines, or nine units in total, from Chinese power plant developers. April 9 – “Accelerating Energy Transformation” will be the theme for the Singapore International Energy Week (SIEW) 2019. This theme has been chosen by the Energy Market Authority (EMA) of Singapore to address mounting challenges in Asia over meeting climate change commitments against a backdrop of continuously rising energy demand. April 8 – The French utility ENGIE has inaugurated its first PowerCorner – an off-grid renewable energy solution – in the Zambian village of Chitandika. Located in the East of Zambia, Chitandika counts 1500 inhabitants who previously had no access to electricity. April 5 – Over the next five years, the global gas turbine market is forecast to grow 11.1% annually in terms of revenue, reaching a market size of $24,100 million by 2024, up from $14,300 million in 2019. Market-leading companies include: GE, Siemens, Ansaldo Energia, MAN Energy Solutions, Mitsubishi Hitachi Power Systems and Shanghai Electric Group. April 4 – Siemens is intensifying its cooperation with the EDAG Group, an independent engineering company for the automotive industry, to promote industrial applications of additive manufacturing (AM), also known as 3D printing. The companies’ joint "NextGenerationSpaceframe 2.0" project is on show at the Hannover Messe this week. April 3 – The Swiss manufacturer ABB will ensure smarter, safer and more reliable electricity supply for students at the Milan University’s new campus in Lodi. Covering an area of 20,000 square meters, the campus has installed ABB’s UniSec switchgear and main distribution switchboard solution, System pro E power. April 2 – Chevron Technology Ventures (CTV) has set up Fund VII, a new $90 million fund focused on venture capital investment across the energy industry. Investments target early- to mid-stage companies as well as limited partnership funds with the aim of supporting breakthrough technologies that have the potential to improve Chevron’s oil and gas business performance. April 1 – The German carmaker Volkswagen has chosen Siemens as integration partner for the VW Industrial Cloud. Based on Siemens’ MindSphere system, the VW Industrial Cloud will link production systems, machinery and equipment of various manufacturers at the 122 Volkswagen manufacturing plants worldwide. The resulting data transparency and analysis is meant to enhance productivity at the sites. March 29 – Marubeni Corp and 4R Energy, along with SIGNET EV have achieved a Proof of Concept (PoC) using 4RE’slarge refurbished batteries for the development of the world’s first mass-productional EV charger in Namie-machi, Fukushima-Prefecture. The installation, with an output of more than 50kW, helps the community reduce electricity demand from the central power grid, which saves costs. 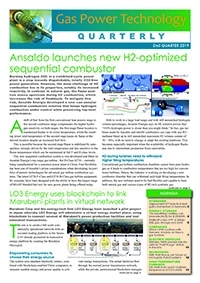 Latest issue - for free! Copyright © 2017 Gas to Power Journal, 1st Floor - 30 Warner Street, London, EC1R 5EX, UK - Natural Gas Power Generation, Combined Cycle Gas Turbine Generation.